We’ve been moved in a few weeks now. The boxes are (almost!) gone from the hallway, the kids (all four of them!) are settled in, and things are looking sorted. So on the weekend it was time to put up our own new Lilliput Library. Lilliput Libraries are a community project, started in Dunedin by Ruth Arnison a few years ago. Our own library is No 109, so there are a fair number around Dunedin now! You can view their locations around Dunedin on Google Maps. The project has a WordPress blog, also run by Ruth. The Libraries also have a Facebook page and an Instagram page, with some lovely images of the various libraries around Dunedin. Take a look. Some of the artwork is absolutely beautiful. This is my friend Lhizz Browne’s Lilliput Library. Lhizz’s Lilliput Library is up and running at 186 Pine Hill, so drop by and grab or add a book to this lovely library. 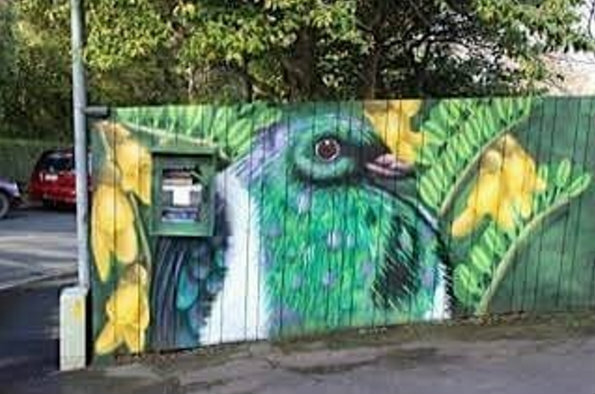 Diane Smith’s beautiful Lilliput Library and fence artwork by local artist Jack Pillans. Sharing books is a wonderful thing to do! Return or donate a book later. Whenever you see a Lilliput Library, feel free to open the door and have a browse. Choose a book you’d like to read. You can keep the book for a while, or forever – Lilliput Libraries are cost-free, and there’s no membership required. Then, if you are able, share a book back to any Lilliput Library when you can. If you’d like to become a “Guardian” of a Lilliput Library in Dunedin, contact Ruth Arnison via the Lilliput Libraries blog. She’s a lovely lady and is incredibly helpful. 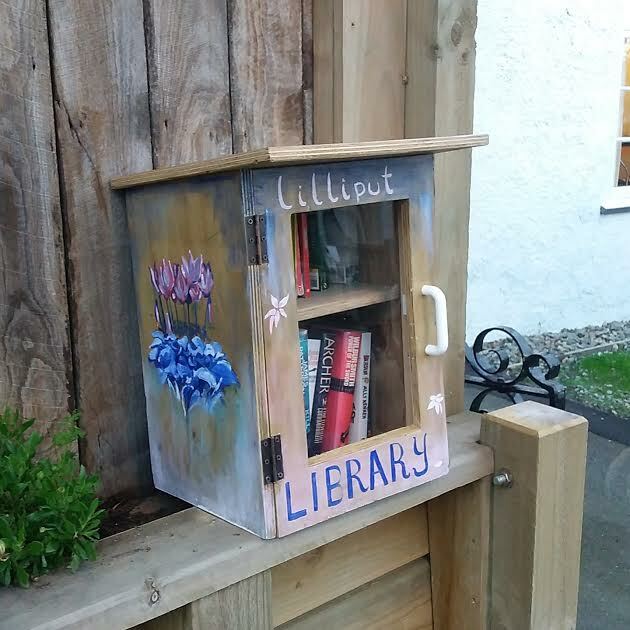 If you’re an artist or have carpentry skills, or can donate paint or woodworking products and you would like to support the Lilliput Libraries project, please also contact Ruth. 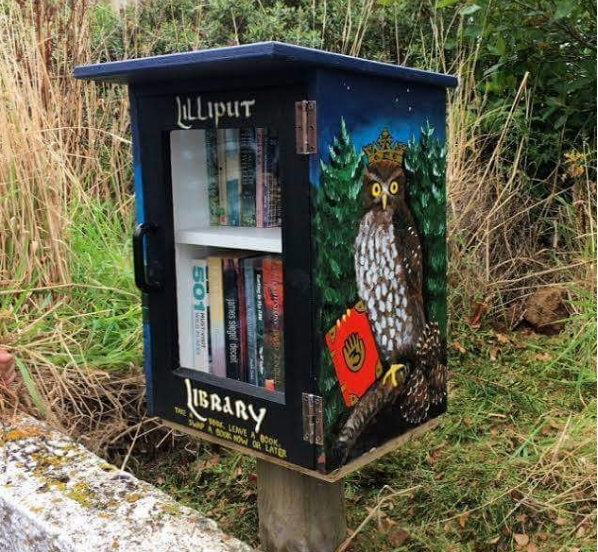 If you live in another city and would like to start up your own Lilliput Libraries scheme or build your own independent Lilliput Library, I can’t think of a lovelier way to encourage community and reading! These libraries are a wonderful idea! They have such beautiful paintings on them, too! Having been a librarian for ten years, I can’t tell you how much I love this post! We have some of them here in Albuquerque, although I’m not sure what they are exactly called here, other than “little free libraries.” I will need to find out how you can start one around here. I do love the idea of sharing knowledge.